Still missing from this round are detailed reports on the demand modelling. A few numbers are cited as part of the presentations, but not a full examination of the networks and options that were modelled. What service levels are assumed on each of the routes especially in cases where they will compete for riders? How are “SmartTrack” and “GO/RER” riders in the same corridor differentiated from each other? How much contribution does each service make to “relief” at Bloor-Yonge? How many riders on any line are net gains to transit, and how many are shifted from other routes? We have already seem demand projections rise and fall for the Scarborough Subway, and we are still owed an explanation of the high projected demand that was used to justify a switch from LRT to subway technology in the first place. Was this simply a professional error, or a politically motivated con job? Can we trust the new numbers any more than the old? The issues before Council involve not just one line, but a large network with planning and construction commitments lasting decades. Cooking the figures to advance specific projects whether they be for SmartTrack, subway or LRT will set us on a path where, a decade or more out, we will ask “why did we build that”. A related aspect of the model outputs will be not just the peak direction numbers for inbound trips, but the demand to nodes other than downtown. For example, how many riders will come to the Unilever development via the four separate routes (GO, SmartTrack, Relief Line, streetcar) that will converge on it and where will they originate? How many riders will travel outbound to the Scarborough Town Centre which, in theory, is poised to become a major job centre? Will STC remain a heavily car-oriented precinct, or will it begin a shift to transit? The same questions apply to the Airport Corporate district and parts of the waterfront. 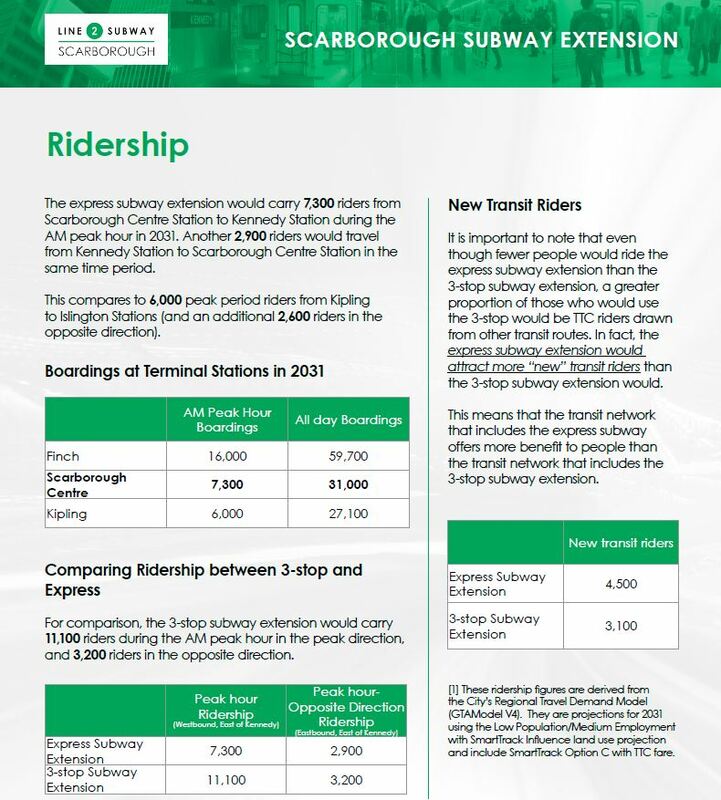 The updated ridership estimates for the Scarborough Subway reawakened debate about just how many riders are needed to justify this type of investment. Anticipated peak hour demand southbound from Scarborough Town Centre is comparable to existing subway terminals and so why shouldn’t Scarborough get a subway? Ironically, the demand at any terminal could be portrayed as a negative if it is “too high”, as at Finch, because capacity would not be available downstream. Has subway planning been reduced to a “Goldilocks” question of getting the terminal demand “just right”? The situation is more complex than this. If only the terminal ridership number is used, the subtleties of network behaviour are lost. The basic question is not simply the magnitude of demand. Where does it come from – a single fairly dense area around the subway, or a more diffuse collection of origins – and where is it going? How important are feeder services and how much of the feeder network would a subway extension eliminate? What are the implications for travel time for the whole market, not just for the link replaced by the subway extension? Subway terminals today are artificial nodes in that they exist as points where many feeder routes converge, not as destinations in their own right. Neither Kennedy nor STC stations exist primarily to serve local demand, especially Kennedy where planning policies throttled growth at the subway terminal lest it compete with STC. The rationale behind an LRT network (and indeed behind the original LRT plan for Scarborough four decades ago) was that it was extensible at modest cost compared with a subway line and could provide better coverage. 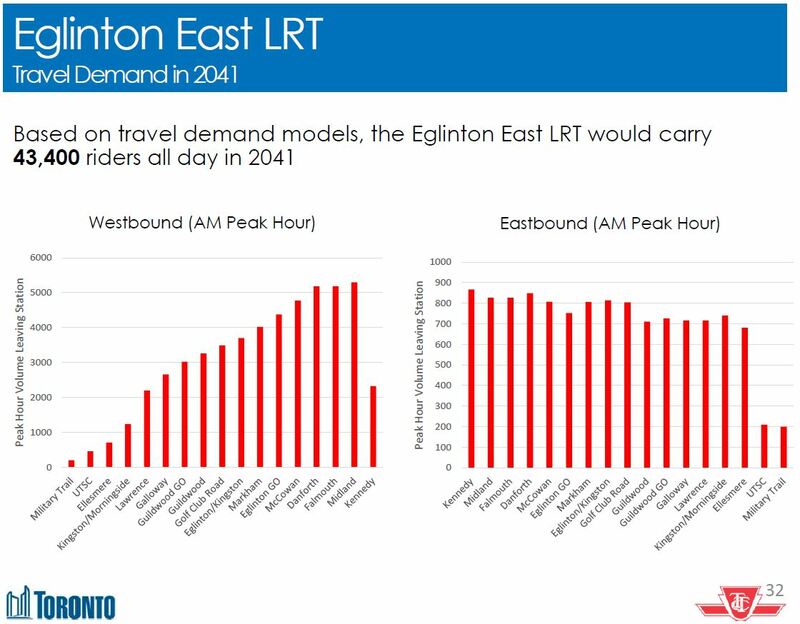 The projected peak demand on a Scarborough LRT was actually higher than the new subway projection, in part I suspect because the LRT line would have gone further into northeastern Scarborough. The debate would then turn on just “what is LRT” and whether its service would be comparable to a subway network. For this line, the “LRT” would have been completely grade-separated with widely-spaced stations, and it would operate at near-subway speed constrained mainly by the effect of extra stations. Time lost to the transfer (much improved over the RT) at Kennedy would be balanced by gains for riders originating east of STC who still face a bus feeder trip under the current plan. It is simply not practical to keep extending a subway forever because eventually the demand becomes too diffuse, and the money would be better spent on a different approach. For Scarborough, the transition was originally to be at Kennedy Station, but STC has become the new centre at which the transit network will aim. The pitched battle between subway and LRT advocates prevents a discussion of alternatives, and my personal sense is that this debate is over. However, the fundamental planning issue that a subway must end somewhere and give over to a network of feeders, be they bus or LRT, remains a challenge on all of our subway corridors. The lure of building “just one more stop” is very strong. In all of the presentation materials, the most threadbare, the least informative, is the section dealing with SmartTrack. This is no surprise given that the original plan was little more than an election gimmick, but it has morphed into a central part of Mayor Tory’s program without benefit of many vital components. The original cost estimate of $8 billion is little more than a back-of-the-envelope number derived simply by taking the total mileage and multiplying by a notional cost per kilometer. That was back before ST boosters were forced to admit that an “overground” alignment through Mount Dennis, let alone along Eglinton West, was not feasible. This $8 billion was divided three ways – city, province, feds – but Queen’s Park’s caveat was that theirs would be “in kind” through the expansion of GO infrastructure in their RER project. As for Ottawa’s money, we still do not know whether this would be part of Trudeau’s billions soon to flow to cities across the country, or if it will be treated separately, a leftover goodie from the Harper era. On the provincial front, the funding is effectively capped at what is needed for RER, and if Toronto wants more capacity, they will have to pay for it, assuming it is even physically possible. A notable constraint is the limit on train and passenger movement through Union Station, but this is not the only potential bottleneck. If the federal money is taken from the general infrastructure stimulus pool, then SmartTrack will pre-empt spending on other projects that might otherwise have shared in Ottawa’s new funding. At the City level, the 1/3 share for SmartTrack is considerably more than the money to be raised through the Scarborough Subway tax. Candidate Tory claimed that this would come from “Tax Increment Financing”, a scheme that depends on the uplift in property values through transit-induced development. However, this mechanism is more appropriate for “brownfield” situations where a derelict neighbourhood is reborn, and the funding available from TIF will not be anywhere near the City’s share (even assuming that Queen’s Park passes enabling regulations to make TIF possible). We don’t really know what “SmartTrack” will cost as a project because we have yet to learn the details of service it will provide and infrastructure it will require. Then there is the small matter of operating subsidies, and just what a “TTC fare” that SmartTrack would charge will really be when service begins. We still cannot get a straight answer out of the TTC on the effect that the Metrolinx “integrated fare structure” will have for subway riders next year, let alone for SmartTrack riders in 2021. If the scope of SmartTrack, especially the more heroic parts of its original infrastructure needs, is scaled back, then the cost may well come in below $8 billion. But that cutback will also bring a reduction from the claimed service level, ridership and overall attractiveness of the line. What was touted as the one project to solve every transit woe by Tory’s campaign will instead be a marginal improvement on already-planned GO/RER service. All day ridership of 200,000 (the level claimed in Tory’s campaign literature) is simply not credible without very frequent service, and that is physically impossible without more infrastructure than GO plans to build. The marginal ridership contributed by SmartTrack over GO-RER is under 30,000, a huge reduction from the original 200,000. This has immense implications for the “business case analysis” of SmartTrack because there will be so many fewer riders than claimed during the election. 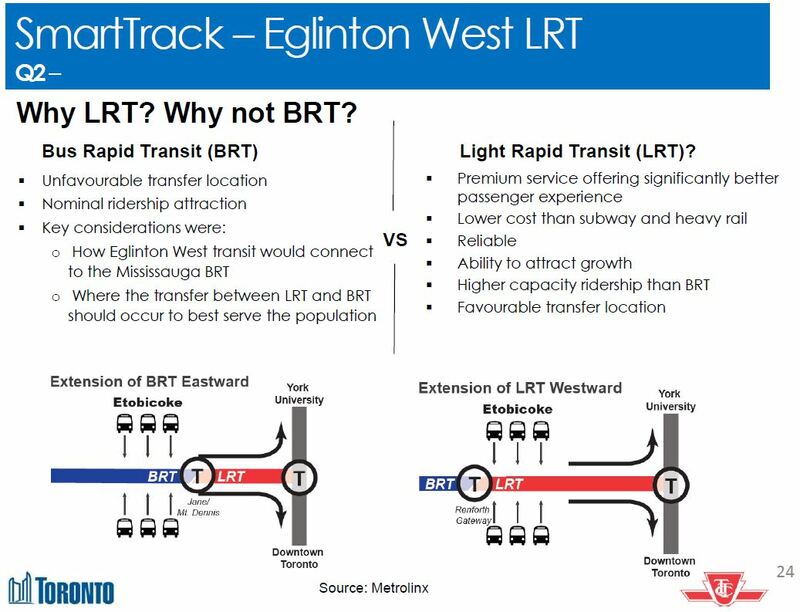 We know from earlier reports that the LRT option on Eglinton actually improves ridership, and so some of the “SmartTrack” riders are really LRT riders. GO RER and SmartTrack will help relieve many of the transit network’s capacity limitations, which currently affect many parts of the City, including the subways serving Downtown, the SRT in Scarborough, streetcar routes east and west of the downtown and individual bus routes throughout the City. It is intriguing that the effect is now a joint one between GO and ST, and that we are still worried about relief of SRT demand even though it is to be replaced by a much higher capacity subway. As for the streetcar routes, there are limited points of contact, and the attractiveness of ST would depend on a fast, convenient transfer connection. If SmartTrack ends up providing only four trains per hour (a 15′ headway), this will be a far cry from the frequent “subway-like” service claimed during the election. Demand modelling already run for the City shows that very frequent service is needed for SmartTrack to attract riders and have the scale of benefits claimed for it. The disparity between those claims and the likely implementation has not stopped SmartTrack from triggering a gerrymander of other transit plans. In Scarborough, the absence of a subway station at Lawrence East is explained away by the presence of a SmartTrack station where the RT now stops. However, with a train every fifteen minutes, riders may long for the day when their major complaint was the inconvenient transfer from RT to subway at Kennedy Station. Oddly enough, Lawrence East ST station was not included in one of the two configurations proposed earlier in 2016, but it has reappeared as a necessary adjunct to the “one stop subway extension”. Closer to downtown, the Relief Line was originally to sit entirely at Queen Street, nominally for technical reasons related to construction, but also no doubt so that it would not compete with Smart Track as a service to the Unilever site. Fortunately this design was rethought in the most recent round of consultation, and the Relief Line now serves Unilever as part of a transit hub. The Eglinton West LRT , an 11km westerly extension of the Eglinton Crosstown LRT from Mount Dennis to the Mississauga Airport Corporate Centre and beyond to Toronto Pearson. In other words, an LRT line, something originally dismissed by Tory as an unsuitable transit alternative, has not just replaced the western leg of SmartTrack but become part of the “SmartTrack” brand. 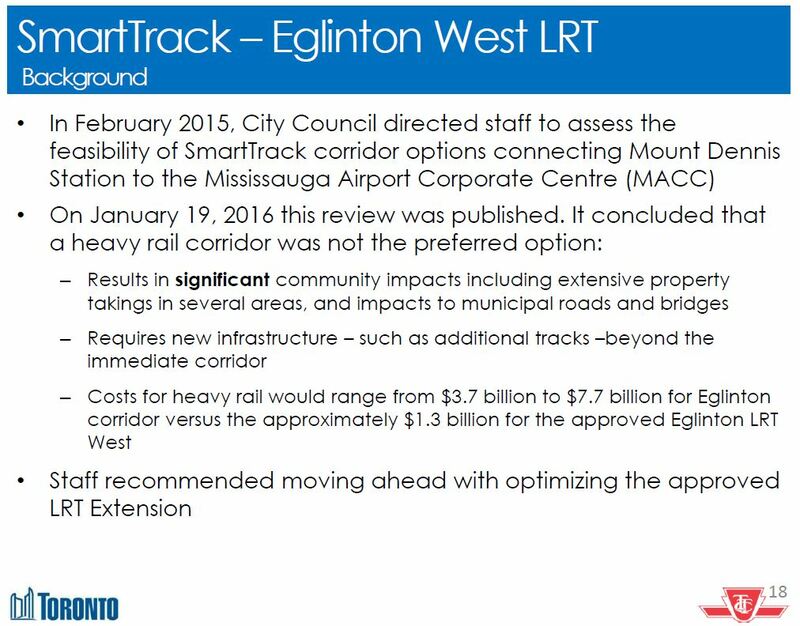 We could end up paying for the Eglinton West line out of “SmartTrack” funding much as the Eglinton East line is to be built with redirected Scarborough Subway money. Equally important is what SmartTrack will not do for riders on other GO Transit corridors. Riders within Toronto on the Milton, Barrie, Richmond Hill and Lake Shore corridors will face whatever GO’s fare structure will be, and will not have a City subsidy for a SmartTrack service, whatever that might mean. This has a spin-off effect on the design of local services parallel to these corridors. Why should only riders in the Weston and Stouffville corridors benefit? SmartTrack is a scheme that changes every time it is presented to the public, and its role diminishes at every iteration. Even so, planners continue to pretend that it is a “real” proposal, and integrate it, to the degree possible, in their plans. A better approach would be to collapse the travel requirement ST represents into the overall plan rather than trying to maintain a separate brand and service. This would not please the Mayor, but it would be better planning. 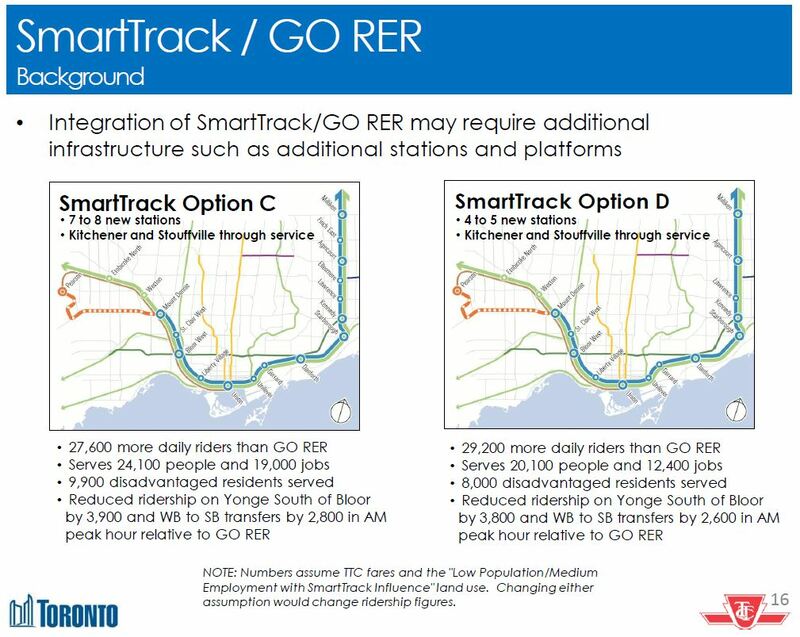 For information on the February 2016 Metrolinx review of GO’s co-existence with Smart Track, please see How Will SmartTrack and GO/RER Co-exist? The LRT line on Eglinton West already has an approved EA, but the project halted through a combination of Rob Ford’s anti-LRT stance, Metrolinx’ desire to build only the central part of the line east from Mount Dennis, and then John Tory’s ill-conceived scheme to run a heavy rail line on the surface of Eglinton outward from the Weston rail corridor with SmartTrack. That part of Tory’s plan came unglued fairly quickly when the professional planners told him what he could not stand to hear during the election campaign – the branch along Eglinton would be ruinously expensive and disruptive to the neighbourhoods in Mount Dennis. Tory’s campaign advisors, some of whom are professional transit planners, have a lot to answer for with their grossly misleading claims about this section of SmartTrack in particular. 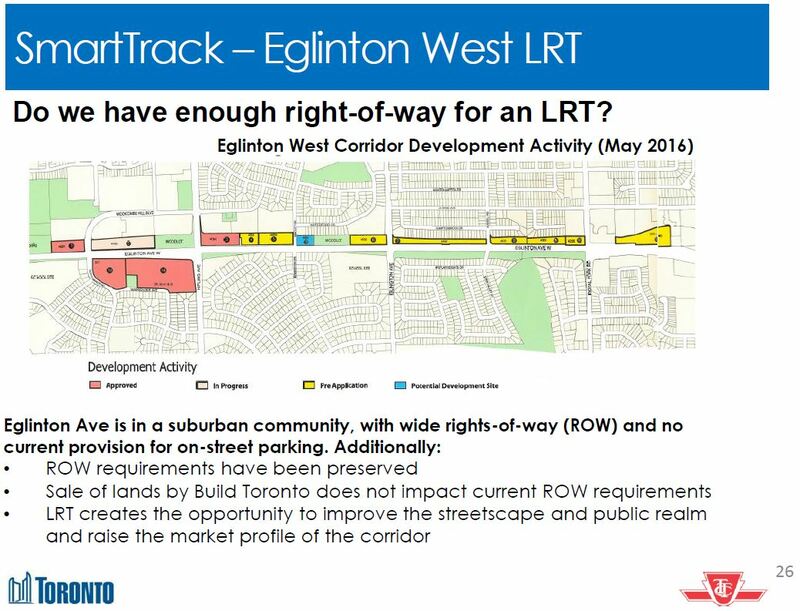 One of the questions arising during public consultation has been why Eglinton West should be LRT rather than BRT (bus rapid transit). Both would consume road space, but BRT is perceived to be less intrusive, if only because so many implementations have been “BRT lite” with less priority and space dedicated to them than mmight otherwise be devoted to LRT. Study of the BRT option concluded that the Renforth Gateway south of Pearson Airport would be the better place for an interchange between the Eglinton West LRT and the Mississauga services coming east via the busway. If the connection were at Jane & Eglinton, this would be a classic “middle of nowhere” transit node that would add a transfer connection for anyone travelling east-west along the corridor. That would affect both riders from Etobicoke headed east to the Spadina subway, and riders heading west to the airport. If the connection were at Mount Dennis Station, it would at least be at a future node, but at the cost of substantially greater bus traffic into that terminal. The extra transfer connection for most through trips would remain. This is an example of the problem discussed above about the logical place for a line’s terminus. A major justification for SmartTrack was to serve the airport region, but imposing breaks in the network at other locations would work against that goal. Still under study is the selective grade separation of the LRT at locations where right-of-way is limited or where traffic constraints would make a surface route difficult. These include the section immediately west of Mount Dennis Station (already planned to be underground), the 401/427/Hydro junction southeast of the airport, and river crossings enroute. Land along the corridor was originally intended for the Richview Expressway, but this was never built. A great deal of the land has been sold (a fact that SmartTrack’s authors missed in their cursory review), but enough has been kept in public hands to allow construction of the LRT line. The line is expected to carry 60-70,000 riders daily although until we see the detailed projections, it is unclear how many of these riders are bound for the core area and by what route (Weston rail corridor vs Spadina Subway), how many will make counterpeak trips to the airport area, and how many might use the line to reach Pearson Airport itself. Technical work on the details of stop location, possible grade separations and route alignment will continue through into fall 2016 leading to a recommended configuration and a refresh of the Environmental Assessment for the project. How does any waterfront service relate to GO Transit’s RER network and/or to SmartTrack? What are the demand projections for waterfront lines and the capacity constraints of infrastructure such as Union Station? Why are potential costs treated as unaffordable when comparable if not larger sums are proposed for other parts of the network? Toronto still has no sense of just what new services in the Waterfront might be expected to do, particularly west of downtown. There is no “SmartTrack” service planned for Lake Shore West, only the upgrades, such as they will be, for GO/RER. Added to that is GO’s concern that they will be capacity constrained in the corridor, and so the amount of room left for “local” passengers from inside the 416 will be limited. This creates more pressure for an LRT solution to the demand problem in southern Etobicoke, notably with all of the new condo construction. With the schemes now on the table, a Waterfront West LRT would consume transfer capacity at Union Station, and could prove difficult to thread through the existing street system. There is no demand projection yet for a WWLRT, and that demand will depend on both the alignment and stations for such a line, as well as the alternatives, if any, available such as the GO corridor. As for the eastern waterfront, that project has been hung up for years because of the estimated cost of expanding capacity at Union Loop. More recently, schemes have appeared that would sever the link from Queens Quay to Union Station, and this could further hobble plans for LRT service to East Bay Front and the Port Lands. SmartTrack is not an option for these areas because the rail corridor is too far north and stations would be too far apart to serve these areas. However, that did not prevent ST advocates from claiming that their line would solve waterfront problems in the early days of various studies. Fortunately, that idea has fallen off the table. Since the February update on the Relief Line, Where Should A Relief Line GO?, City Planning has had second thoughts about the alignment. The February 2016 recommendation had been for a route south on Pape and then straight west on Queen to City Hall. Now the favoured route is via Pape to Eastern Avenue, then west to serve the Great Gulf development at the Unilever site, swinging back north to Queen between the Don River and Parliament Street. The change in sentiment over the past few months is reflected in the scoring of alignment options. Back in February, the competition was between Broadview options (not shown), routes to downtown via Queen (the “B” options) and routes via King (the “D” options). By June, the nomenclature and option combinations had changed. I have shown only the Pape Avenue options here with the route via Queen (“AQ” equivalent to “B1”) and via Eastern (“EQ” equivalent to “B2”). The numeric values used here correspond to the “moon” values in the original reports (4 = full moon, 2 = half moon, etc). Quite clearly, the ranking of the two alignments has changed, but the details behind the new scores have not yet been published. This is the sort of thing that makes one suspicious of such evaluations. Possibly new information (such as the importance of the Unilever site) has come to bear, but it shows how, had the definitive route been chosen only months ago, Council might have received the “wrong” recommendation. Details of the stations on either side of the Don River appear below. The proposed station at King and Sumach makes a much better connection with the transit system (King 504 east-west and Cherry 514 south) than a station at Queen would have. Nestling under the Richmond-Adelaide ramps from the DVP, the route threads its way through a tricky neighbourhood. The shift back north to Queen is not shown in the drawings, and the generic maps show the alignment passing directly under a large church at Queen and Power Streets. Some fine tuning is needed here. 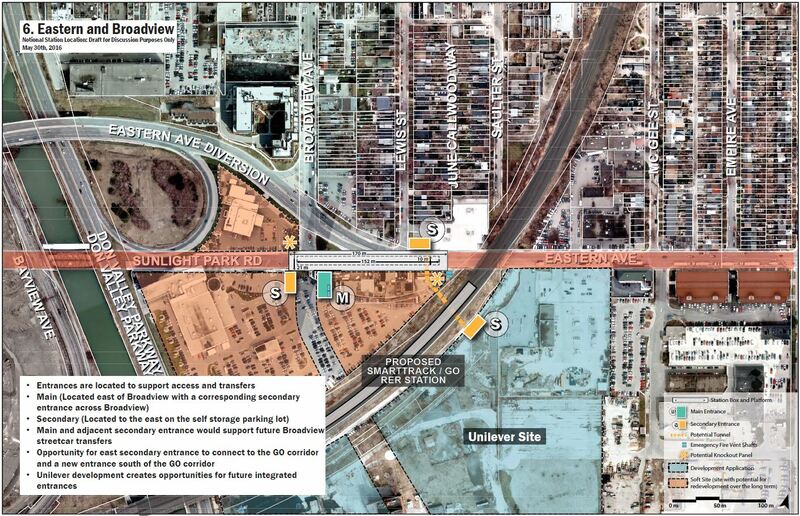 A new station at what is now the foot of Broadview Avenue would be part of a major transit hub at the Unilever site to include SmartTrack, GO-RER and a Broadview streetcar connecting south into the Port Lands. Another change in the revised design is that the single “City Hall” station has now become two separate stations linking to the existing Queen and Osgoode stations on the YUS. Which design survives is anyone’s guess. Staff at the presentation I attended indicated that these designs are only “for discussion”. At Pape and Danforth, the Relief Line station would lie to the north of the Danforth subway. Links to the existing line would be built as west-to-north and south-to-west curves that would begin north of the station. Trains from Greenwood Yard would enter service westbound on Danforth and then turn north. They would leave service southbound turning west to the centre track at Chester Station, and then head east to Greenwood. There is no discussion of the option of a tunnel under the rail corridor from Pape and Gerrard east to the south side of the subway yard. Although “phase 1” of the Relief Line is the focus of current presentations, the recent announcement of $150 million for detailed study of the entire line (phase 2 north to Don Mills via Thorncliffe Park, and phase 3 west and north to Bloor/Dundas) means that the full line will get the thorough review it has needed for decades. For far too long, discussion of the RL began and ended with “we don’t need it and can’t afford it” with no examination of the benefits, offsets for expansion elsewhere, or place in the overall transit network. Too often, transit proposals are dismissed without proper study because they don’t fit the political imperatives of the day. Now, however, both the crisis in downtown subway capacity and the desire for a subway extension to Richmond Hill have revived interest in the Relief Line as a line that will be more than a Pape-to-downtown offload for peak traffic. Originally, SmartTrack advocates claimed that a Relief Line was superfluous because ST would provide all the “relief” that was needed, and Mayor Tory held to this position into late 2015.The service levels SmartTrack will offer, however, do not provide the sort of relief people really want to see as the numbers in the ST/GO/RER charts above show. Now his position has changed, and he now accepts, indeed urges the importance of both schemes with SmartTrack providing interim additional capacity by 2021, and the Relief Line adding more nearly a decade later. The challenge will be to get the northern extension underway as soon as possible, preferably while phase 1 is still under construction, so that the larger benefit of the Don Mills subway will be felt as early as possible. It is not yet clear how Metrolinx will provide distribution for passengers from the new terminal through the downtown area. It was furthest from the SmartTrack service in the Stouffville rail corridor and thence least likely to duplicate service and cannibalize ridership. A Lawrence/McCowan location for a station was the best among the north-south routes. The cost of this route was the lowest. Since then, the scheme has lost both its Sheppard and Lawrence East stops, and the Eglinton East LRT from Kennedy to University of Toronto Scarborough Campus has, like its western cousin, reappeared on the transit maps. 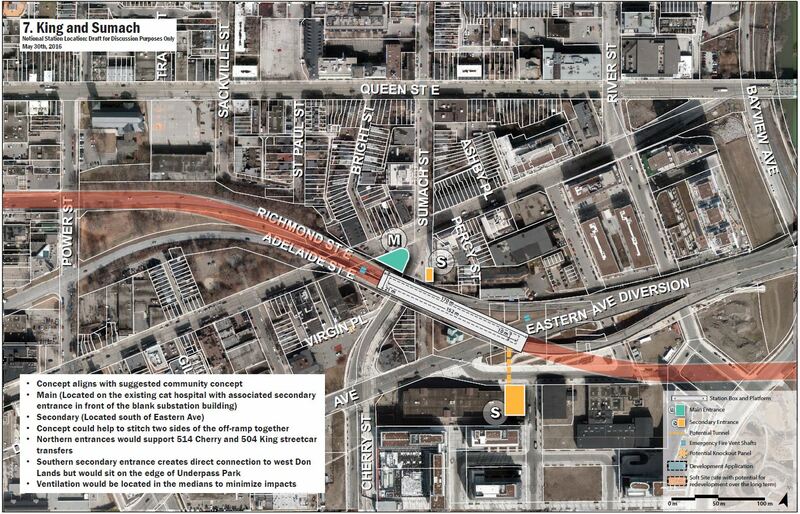 Although there will likely be a SmartTrack station at Lawrence (the site of the current Lawrence East RT station), it will not directly serve the hospital at McCowan as the subway would. 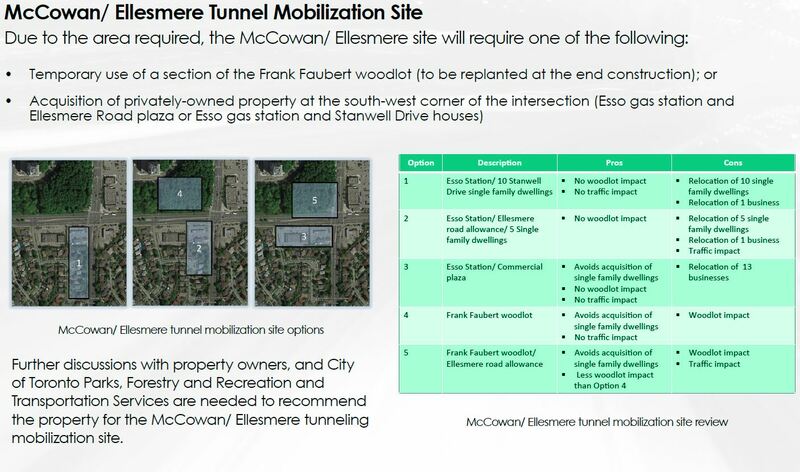 Construction is planned to be by a single deep bore tunnel south from Ellesmere and west to Kennedy Station, but by cut-and-cover in the station area within the STC. This has triggered considerable debate about the effect of the launch site for the bore (a structure similar to what we already have on Eglinton at Black Creek and at Brentcliffe). The tradeoff is between the acquisition of commercial or residential property, or the cutting of a substantial chunk of the Frank Faubert woodlot. Which of these wins out remains to be seen, but my own preference is to stay within the commercial property which can be redeveloped after subway construction is completed, but there is no “perfect” solution unless the launch site were completely removed from this intersection. Where else it might go is a challenging question, and the presentation gives no indication of whether other locations were considered. Ridership projections for the line have anticipated criticism that there are not “enough” riders to justify a subway. The pretzel-like shape into which planners have been twisted is amusing, but it is also a sad commentary on the political context of the debate. There is no problem per se with the subway only having 7,300 riders at STC inbound in the peak hour, and this is certainly in the same range as other subway terminals (not to mention better than projections for the Vaughan extension). The real question, as discussed earlier, is whether STC is the appropriate location for the subway-to-surface transition in the network. However, a clearly well-cooked projection of 14,000 riders was used to “justify” the shift from the original LRT plan to subway. Some of these modelled riders will now be on the SmartTrack service, and some may never have existed. We do know that some of the original “demand” came from Markham with commuters feeding south into the Sheppard terminal much as York Region riders now feed into Finch. In a particularly convoluted argument, the presentation claims that although peak period ridership for the 1-stop line will be only two thirds of the 3-stop version, this is somehow “better” because the express line will attract more new riders. What is unclear is whether those riders might otherwise have been attracted to SmartTrack or GO rather than to the express subway as demand models are notoriously sensitive to travel time in making trip assignments. In January 2016, Toronto’s Executive Committee passed a motion to “support the development of Scarborough Centre as a vibrant urban node”, whatever that may mean. In fact a single subway station might be less successful than a multi-stop LRT passing east-west through the STC planning precinct (much larger than the mall and civic centre), but this detail is conveniently ignored because the LRT option is no longer on the table. Scarborough politicians hope that the subway will stimulate a long desired level of development in the STC precinct. Toronto’s experience at other terminals suggests that there will be a long wait for anything other than high density residential buildings made attractive by a quick access to downtown. The basic problem is that many people who would work near subway terminals do not live in the subway’s catchment area and therefore would not use the subway to reach their destination. If the evaluation criteria are reduced to considering only one goal, a subway to STC, rather than the overall network, then the larger decision has already been made just as with the proposed Richmond Hill extension of the Yonge line. It is ironic that if SmartTrack actually were built as originally advertised, and especially if this service existed on both the Stouffville and Lake Shore corridors, the demand now funneled through STC and Kennedy would shift to these corridors. That demand would be overwhelmingly oriented to the core area because there is no “there” around the rail corridors which serve primarily old industrial zones. 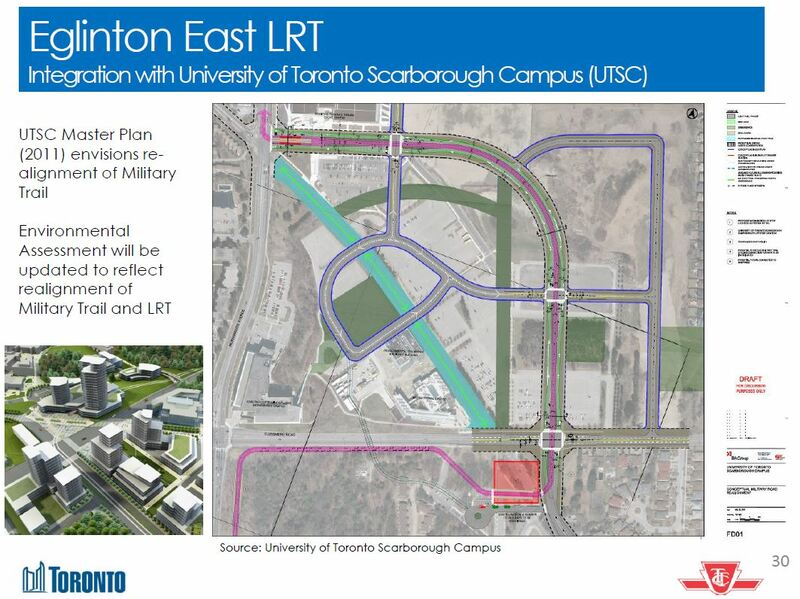 The Eglinton East LRT will run from an underground loop at Kennedy Station, surfacing on Eglinton and then going east via Eglinton, Kingston Road and Morningside to the University of Toronto Scarborough Campus. On Morningside, the line will run on its own structure over the Rouge River and then loop through UTSC looping ending, initially, beside the Pan Am Aquatic Centre. At this point, it is unclear how the approach to Kennedy Station will interleave with the SSE itself and with the revised Crosstown LRT station design. Within the campus, there are plans to realign Military Trail to follow the perimeter rather than crossing diagonally through the site. Revised June 6, 2016 at 11:30 pm to include an updated version of the demand chart from City Planning. The projected demand is 43,400 all day riders by 2041. During the AM peak, the majority is inbound to Kennedy by a wide margin. UTSC is a major destination, but the outbound peak may not co-incide with the commuting peak inbound. This is a more general problem for academic institutions like universities whose hours and locations do not fit the standard commuting pattern, but whose students are more transit dependent than the average population. The nature of demand to UTCS bears further investigation once the detailed demand projections have been published. This entry was posted in A Grand Plan, Beyond 416, Downtown Relief Line, Eglinton LRT, GO Transit, Scarborough RT/LRT/Subway, Scarborough-Malvern LRT, SmartTrack, Transit, Waterfront. Bookmark the permalink. I assume you plan to inform Enbridge that you intend to sever Line 9 during construction before you break ground. I mean, you may want to give them a chance to turn it off first. The planners at the meetings seem to be far more obsessed with Ryerson University than George Brown and their line of buildings stretching all the way to the Distillery and the new student residence located there. Dare I say college students are being treated like second class citizens vis-a-vis their university counterparts? I don’t trust their noise estimates at all if they think a goose goes quack. Steve: This project appears to be ornithologically challenged. At least they didn’t use a mute swan. Has anyone heard any discussion of where crossovers and storage tracks might be built on this line? In terms of noise, I would be way more worried about noise from special work than tangent track or even the curve at Eastern. My guesses would be a crossover south of Danforth, one at either Queen or Unilever (probably the latter due to space constraints at the former), one east of Yonge, and one east of University and perhaps a storage track on the west side. Where planners say they would prefer not to build a station on the west side of University I have to wonder if they account for the structure that would have to be built at the minimum for a tail track. I believe that the Red Line in Chicago had stations that were to double as bomb shelters a la London Tube in WWII. The fact that nuclear radiation would filter into the station and fry everyone’s DNA seemed to escape their notice. Actually, since gamma intensity drops by half for every 9cm of compact dirt it passes through and radiation is a line of sight issue, subway stations are ideal as fallout shelters. It’s just that keeping the fallout dust out and ensuring that everyone down there has enough food, water, clean enough sanitary conditions, and sanity for two weeks were what everyone forgot to consider. And the station I was thinking of was Jackson-Monroe-Washington-Lake. For those not in the know, all four stations are stretched out along a single island platform. In the future, enhanced GO stations at Roncesvalles, Queen West, Parliament-Cherry, Unilever (DVP-Eastern) and Gerrard-Coxwell with a tie to the DRL could provide the distribution capacity for the downtown core. By running the DRL across Queen they would stay to the North end of the Path and lessen the load on Union. A small premium (fare surcharge) to start/finish your GO ride at Union would immediatly shift riders to the alternate stations. For now, building the Exhibition to Dufferin link (EA approved) would allow Exhibition to dump riders on an extended 514 Exhibition/Dufferin/King/Cherry streetcar. And the King transit corridor means the ride will be smoother sailing. The results of the Metrolinx station study will soon throw light on this, and fare integration could/should make the transfers seamless…. Steve: “Seamless” but for the physical move involved and the relative slowness of the surface route link into downtown, not to mention taking capacity that we already don’t have on the surface network to act as a GO distributor. I was trying to avoid getting technical but I was worried more about radioactive fallout, especially from my favourite basketball score; Strontium 90, Cobalt 60 plus a few other radio isotopes that would drift into the station. I like that station because you can walk between them underground unless there is someone there to yell at you. Regarding Eglinton East, at this point in time I’ll just be happy to see the tracks extending to the Eglinton GO station where the ECLRT should be going anyway. 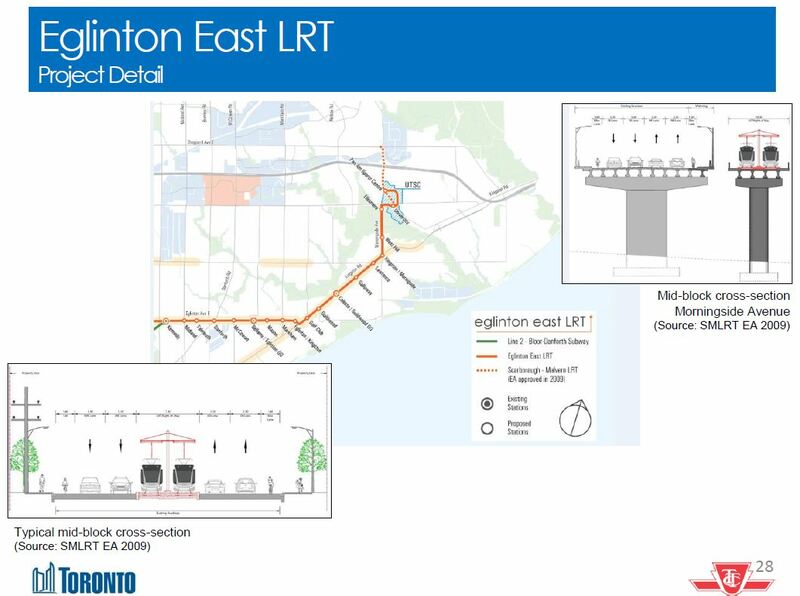 As for Eglinton West, as far as I’m concerned, getting the tracks to the airport is something that can’t come any too soon but I just hope that in the mean time what’s being built now gets the best possible passenger transfer connection. That can only help UPEX. A transfer connection between between the ECLRT and the Mississauga BRT would most certainly be grand as well. That’s why I see it, not the yelling part, as an interesting alternative for the one or two station question for that part of the relief line. Even if the train you are on doesn’t stop at the specific “station” you want to get off at, being underground would lessen the unpleasantness of walking to the station you want to reach. The only catch is whether such an arrangement can work from an operations point of view; even with ATC. Roncesvalles AND Queen West? I’m hoping your intention is those would be on different corridors. Parliament-Cherry AND Unilever (DVP-Eastern)? Cherry Station would either only serve the Richmond Hill corridor or gut corridor capacity. The distance between Cherry Street and Eastern Avenue is about 3 GO-trains long. Bathurst-Spadina is needed to provide north-west all-day service. If you like, it’d be a double platform capacity station (4 tracks between ‘8’ platforms, using the Metrolinx-style of wide platforms counting as two. The access would be 2 ‘mainline’ tracks with a cross-over widening with two spur tracks). It’s one of the few spots (the other being at Don Yard) in Toronto where you can provide more station capacity without either requiring land-acquisition or reducing mainline capacity. Queen West doesn’t have that luxury. I would suggest that the whole thing is a moot point, as the bomb shelter aspect predates nuclear bombs, and the construction started prior to Pearl Harbor. The engineers meanwhile calculated the new system of 8.75 miles of underground tunnels, ventilated with the most modern equipment, could provide sleeping accommodations for about 130,000 persons in an all night raid, with no trains running, of course. Even if the train you are on doesn’t stop at the specific “station” you want to get off at, being underground would lessen the unpleasantness of walking to the station you want to reach. Basically, have a nice extension to the PATH, parallel, but separated from the ROW. Steve: Given the DRL team’s preference for a deep bore tunnel in rock, that would put the PATH extension well below the level of the rest of the pedestrian network. It’s important to consider not just horizontal but also vertical alignment when threading a new line through an existing built-up area. But Steve, I would expect in your perfect transit world that all swan[boats] _would_ be *moot*. Steve: Tee hee! But not “moot” which implies they are just for the sake of academic argument. They would be real Swan Boats! With appropriate training, they might even make their own stop announcements! Heads up for readers. The city has added two dates for Relief Line meetings: June 15 and June 20. I’ll bet these were added because city staff are now ready to release all of the information and data relating to the recent changes. I haven’t gone through the whole thing yet to check for changes but those are the details behind the scoring changes. The scores in the new RL assessment table cannot be directly compared to the old ones on an absolute basis because the new numbers appear to be scored in relation to each other. However the new emerging alignment for the RL does score higher than the old one on this basis, where it did not before. Whether one agrees with how they arrived at this new conclusion or not is left up to the reader. Steve: Yes, I will have to compare the now three versions of the alignment study to see how the relative priorities “evolved”. Nice to see an explicit mention of the line north through Thorncliffe and Flemingdon Parks and thence maybe to Sheppard. Picky picky picky! The Donald probably thinks it is still a good bomb shelter. On something completely unrelated. 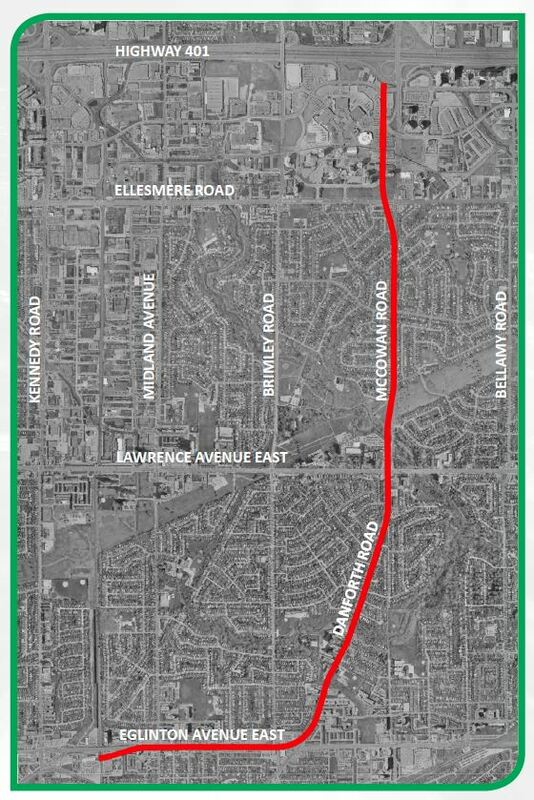 Do you know anything about this freight bypass track for CN around Brampton that Metrolinx and the province are talking about? It’s huge and might become an even bigger deal. It’s only an agreement-in-principle, so it’s all a bit fuzzy, but in general, CN would continue to run up the Halton subdivision to Silver Junction (which would have a rail-rail grade separation) and a new corridor would be constructed north up and round Brampton and connecting back to the existing York subdivision. The ‘bigger deal’ part would come out of the ongoing discussions with CP to buy the Galt subdivision. The concept being flogged is a short (2km) new connection from Tremaine Rd. to RR25/Martin St., and parallel freight corridors to CP Mactier near Kleinburg and the Vaughan Intermodal Terminal and an interlining near Islington/407. The long-term, low-probability best-case, if later agreed, would be if CN/CP were to sell/lease some/all of their ‘emergency running rights’. That would require solutions for Bala and Grimsby subdivisions, plus the mess around Aldershot. I have looked at the new analysis and have preliminary thoughts on them broken down by section. EXPERIENCE: There’s a drastic lowering of EQ travel time score and an associated large drop in relief provided to Bloor-Yonge, Yonge line, and Danforth line. It scores very poorly. AQ still scores well. I don’t understand it but that’s what it is. That raises a lot of strange and interesting questions. What’s going on here? SHAPING THE CITY: The 2041 projected population along the corridor has been revised downward quite a bit. Not a huge issue I suppose. The old numbers had served their purpose as a bullet point against the King corridors already. Staff realize here that EQ might score a bit higher in Transit Oriented Development opportunities than AQ. This managed to escape them in March. 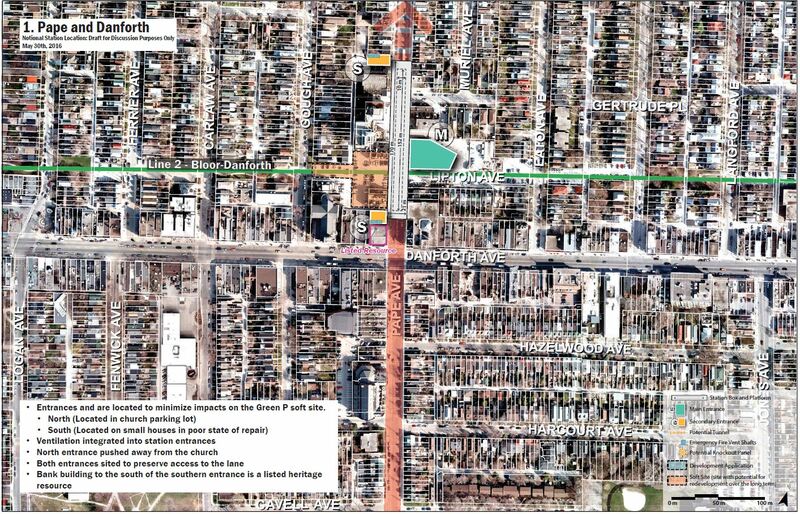 The point is made that by going down to Eastern, it avoids possible impacts on a future heritage conservation district (under study) at Queen-Broadview. My question would then be what of this alignment and its effect on the flesh and blood HCD that already exists on Queen St West? That’s conveniently ignored or forgotten. PUBLIC HEALTH AND ENVIRONMENT: Staff apparently come to the realization that these alignments will have absolutely no impact in getting people out of their cars and on to transit. Amusing. AFFORDABILITY: More oddities in the scoring here. The overall score seems to have changed drastically from March but B2/EQ’s old score of 22/32 was originally scored 2/4 overall. Cost estimates have creeped up another $300 million across the board, most likely due to an extra station on the loop. SUPPORTS GROWTH: Another amazing revelation. Planning staff come to realize the Unilever alignment should actually score higher when it comes to supporting future job growth. Why was it lower than AQ/B1 in the first place? New criteria appear to quantitify impact on business and industry during/after construction and they win this category decisively for Queen-Unilever. Strategic additions of criteria in HEALTHY NEIGHBOURHOODS and SUPPORTING GROWTH had a big impact on the new overall technical scores. Much of the big reversal can be attributed to this new evidence presented at court. In the back of my mind I still wonder how the “D” corridors would have fared if they were to be allowed re-evaluation under the same revelations and conditions. Steve: Thanks for looking through the details. I have suspected that the scores had been massaged so that EQ came out on top, but have been preoccupied with other events and have not combed through the ratings. The whole exercise going right back to the broad alignment stage seemed to be gerrymandered with arbitrary assumptions about what was important, and a lot of double counting by using similar criteria under several groups. All of the background reports with business cases concerning SmartTrack stations, SSE, Eglinton West, Eglinton East, and Relief Line are available now. Council now has 1 week left to study it and make a decision. I’ve only looked at the SSE and RL documents in brief but I can’t help but shake my head when look at the scoring of the “2B” option of the SSE. It scored the highest which of course meant that it was immediately eliminated from further analysis because reasons. (SRT disruption during construction). On the RL front the city appears to have done new modeling with AM peak period, all day ridership numbers, and new riders for their Queen alignments are now up a robust 30-40% over the first set of numbers published in March. Other numbers relating to Yonge relief and Y-B transfers appear similar to the old models. Steve: I am in the process of digesting all of the reports, and will write about them over the next few days. I was looking at SmartTrack Stations, because it’s what interests me the most. The original ST plan had 22 stations, which included 9 existing GO stations (13 new stations proposed). Of those 13, 3 were removed in favour of LRT (Scarlett/Jane, Kipling, MACC), two were superseded by internal GO plans (Unilever for Don Yard, Spadina for Bathurst North Yard), which leaves 8 (7 in Toronto). 14th St, Ellesmere, Lawrence East, and Queen got shot down. Finch, Gerrard, Liberty Village, and St. Clair West at least will go on to the next set of hoops. Thus, instead of “22 new stations” there will be a net contribution of 4 or less. Steve: Although Lawrence East is staging a strong comeback battle. In the absence of a better place to ask this question, I’ll ask here since at least Mapleson is paying attention. How realistic is this? I’m not positive I understand how the rail corridor is allocated, but it seems to me the tracks for “SmartTrack” need to be between the tracks for Milton (western/southernmost) and Barrie (northern/easternmost). Which means spreading the tracks enough for a centre platform, no? I don’t remember how much distance is required to separate the tracks enough to insert a platform, but there’s already only just over 400m between the end of the underpass trench and the curve north towards Queen. Plus the rail corridor is completely constrained on the south side, with buildings right up against the edge of the corridor. All the expropriation would need to be on the north side only, which means moving the Barrie and UPX tracks? All those townhomes would lose their parking, and the gym on Sudbury would have to go. But is that enough? Do they close Douro St too? Steve: Yes, this is a major problem, and it is acknowledged in the Metrolinx report (cited in my article on SmartTrack published after you left this comment). I believe that the station “announcements” of the past two days have been more political flag waving that real planning. They make people who say “I want a station here” go away happy for a time, but eventually, they will learn that their station is either physically impossible to build or too expensive when the obstacles are considered.